As I was getting my IV put in today, I was reading the Domino magazine that came in the mail yesterday. Since it took them 9 tries to get the IV in, I finished the magazine before the chemo even got started. 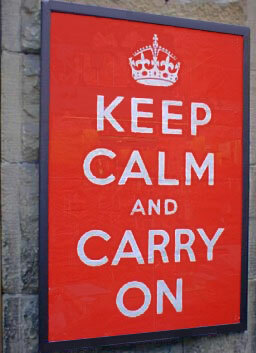 I noticed a poster in the magazine which was posted around Great Britain during WWII. It is a classic. I immediately ordered it after leaving my appointment. It is my new mantra for chemo and beyond. And I have the perfect freshly painted wall in my study to hang it on. Your words always move me. Through your courage and dignity, you teach others how to face it all. Thank you for that and so much more. I love you to pieces! A beloved and retired chaplain colleague always encouraged me with, “Carry on!” So glad you have a freshly painted wall on which to hang that wonderful poster. . .Love you, Brown-eyed Girl! i left for college! and i miss you. . .
You are the epitome of this poster, Ms Meyer-Turner! I’m praying for you as you enter another phase of this battle. May you continue your fight with Churchillian strength! You look so healthy–and I was thinking, “Oh, good! !” I admire your grace as you continue this struggle even as I am so sad that you must continue it. May you feel the presence of God at your side and of all those who love you. So sorry to learn Sunday that you must again take chemo, in your ongoing battle. Be sure that we’re praying for you, each day–that God will give you daily strength and peace, and that the cancer can be eradicated completely. I am glad you’ll be getting a port, so that you don’t have to have 9 pokes/visit!